White-shouldered Ibis (Pseudibis davisoni) are water birds are named for the “collar” they have that appears white at a distance. Once widespread throughout Southeast Asia, these water birds are now considered globally critically endangered and are primarily restricted to the dry forests of north-eastern Cambodia. White-shouldered Ibis rely on wetlands and grasslands for living, feeding, and breeding. However, as these wetlands are target for conversion into agriculture, the species is often seen feeding on rice-paddy fields. Ibises are no longer considered “common,” as there are currently only an estimated 1,000 White-shouldered Ibis, including 670 adults. White-shouldered Ibis are threatened by significant habitat loss, as areas once considered “protected” are now land concessions provided to corporations for development. In fact, over the past few years, about 20% of the Lomphat Wildlife Sanctuary, a stronghold of White-shouldered Ibis in Cambodia, was allocated to companies as economic land concessions. 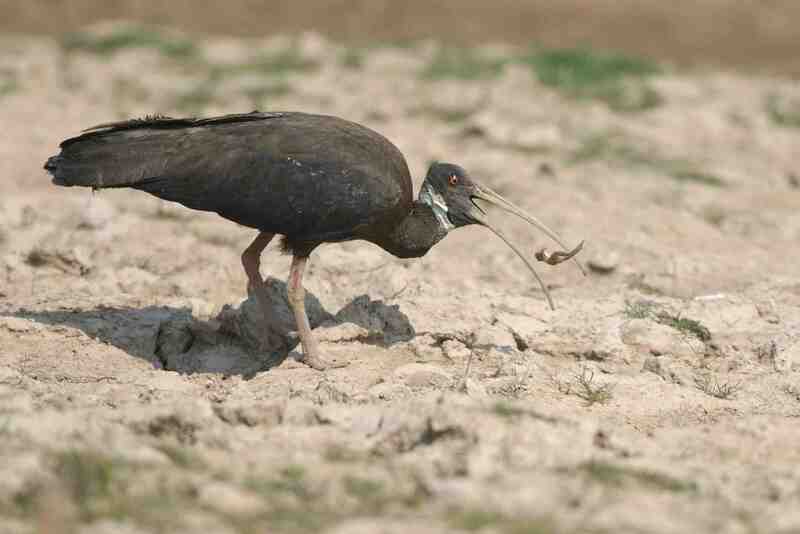 White-shouldered Ibis are also threatened by hunting and egg collecting for human consumption, as well as development of infrastructure such as dams. PRCF Cambodia works with communities in and near the landscape of Lomphat Wildlife Sanctuary and the newly established O’Yadav National Park to establish conservation areas critical for the survival of White-shouldered Ibis. We research the ibis population mapping areas critical for conservation, pinpointing nesting and roosting sites, and train protected area officials and local villagers in how to monitor these critical areas and on nest protection. We also engage community members, particularly school-age children, in raising awareness of ibis conservation and protection. Learn more about our conservation of White-shouldered Ibis in the Lomphat Wildlife Sanctuary.